The methodologies available for the study of rhythms can be subdivided into those methods available for animal use (primarily rodents) and those methods available for use with human subjects. In general, the same methods used to study other rhythmic processes can be used to study the rhythmic nature of seizures. 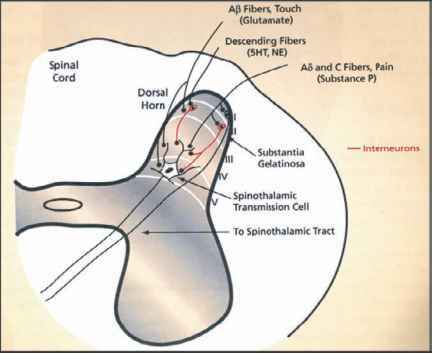 Conversely, those mechanisms used to investigate seizures can be examined for a rhythmic component. For example, the seizure inductive methodologies described elsewhere in this book could be examined for rhythmic components by producing the seizures at different times of the day and then examining for rhythmicity in seizure severity. To further characterize the rhythm, an investigator could place the subjects in constant conditions and determine if the rhythm still exists and whether it continues with a periodicity of its own (Figure 12.3), i.e., whether the rhythm is circadian or diurnal. 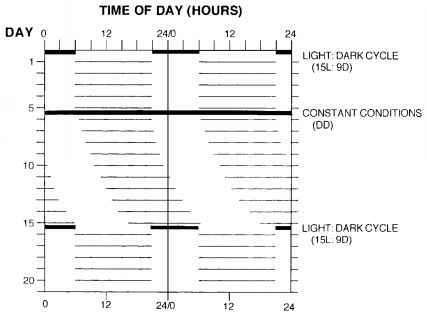 Artistic depiction of a standard "double plotted" circadian rhythm with the peak of the rhythm occurring in the dark and the nadir occurring in the light. This type of figure is generated by plotting the 24-h rhythm of interest on a linear scale and then duplicating the result to the right of the first plot. The next day's measurement of the rhythm is plotted beneath the first day with the remaining days of the experiment following below. This allows the figure to be "read" like a book, from left to right and top to bottom. Experimental treatments are usually placed to the right of the double plotted figure at the time they are begun. Under an external light:dark cycle (days 1 to 5), the rhythm is fixed to the onset and offset of darkness. When the subject is placed in constant conditions (days 6 to 15), the rhythm begins to "free run" following its own endogenous period (tau) which in this case is slightly longer than 24 h. When the subject is placed back into a light:dark cycle (days 16 to 20), the rhythm is entrained to the new photoperiod. Note: The majority of these companies have Internet sites that can be accessed using available search engines.